Most folks think logos are only for headers. But, Google sees your site very differently than viewers. It indexes all the static areas of your site, which include the header, sidebar, and footer. Here are a few tips that will help you increase your SEO by strategically placing items in your sidebar. Usually, the draw to your site is a text link folks find on Google or a link you provide via social media. When viewers click the link, they are primarily seeking the content that caught their attention. But, if you’re marketing savvy, you’ll have a few things in your sidebar that will intrigue them and help keep viewers on your site longer. One of those things should be an image that has your logo or other branding message on it. 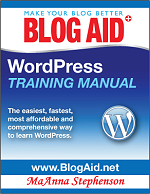 For BlogAid, it’s the image of the WordPress Training Manual. There are three important reasons for including this type of image in your sidebar. 1. Google indexes the contents of your sidebar, including the images. 2. Your RSS feed and shared links auto-choose an image. Often times when you share a link to your site on social media platforms, it will auto select the first image it comes across on your site, and display it as a thumbnail next to your post title/excerpt. If you manually post the link, you may be able to control which thumbnail is shown. But, if you can’t control it, you want to ensure that the image picked has your logo or branding on it. 3. Two logos reinforce your brand. Placing your logo in the middle of the sidebar helps keep your brand fresh in the mind of your viewer. As they scroll down your page while reading your post, a logo will remind them that you’re the source of all the great content. How do you use your logo? These are just a few benefits of including your logo/brand in your sidebar. Where do you reinforce your brand? If your brand is you, do you have too many pictures of yourself in your social media widgets and such? Nice article! Logo is also good in the sidebar for posting purposes, for instance, to Facebook if there is no featured image set, you can select it as the image. That’s right Cyndi, and mostly what I was referencing in the second point. Facebook does seem to pick up on the correct image less than other social media sites. I appreciate you mentioning them specifically.